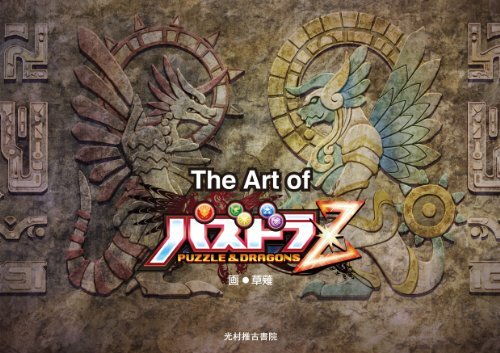 The Art of パズドラZ is the video game artbook for the Japanese mobile game パズドラ, aka Puzzle & Dragons. It's a 128-page paperback that's about the A5 size, landscape. The book features only the background art for the game. No monsters or characters or other gameplay elements such as the jewels. The first part of the book has 30 environment paintings each taking up a spread. These would mostly be scenic landscape art with fantasy elements. There are forests, deserts and ice lands, and more mythical ones like those with stone relics lying around (think Stonehenge but more rocks), building interior of huge gears, corridors in castles, floating islands of land, city of gold and many more. Each environment has accompanying development sketches, a quick rough colour overlay and commentary. The second part features the town and the different buildings, interiors and props. Since the game is played in almost isometric top-down view, the perspective is drawn to facilitate the movement of characters in houses and on the street. There's a very RPG-feel with the short houses and 1-room apartments. The artworks are very beautiful. I like the colours used. They are actually designed by 草薙 (Kusanagi), a company known for creating backgrounds for Japanese games and animated films. Nice book for those who like this style of background art.